The Left Hand of Darkness by Ursula K. Le Guin is rightly considered a seminal work of science fiction. In Ms. Le Guin’s work the human race has long spread out across the universe. Various groups of people have inhabited different planets for so long that they have physically and culturally adapted to their specific worlds, forgetting where they came from and evolving new species of humanity. On the planet know as Winter, due to its extreme cold climate, humanity has evolved by eliminating gender altogether. There is one ambisexual gender on Winter. Most of the time it is male but once each cycle people on Winter enter a sexual phase during which they may become female or they may remain male for the purposes of copulation and reproduction. It is common for one person to take both roles alternatively throughout their lifetime. Anyone who takes only one role exclusively is considered a sexual pervert. Genly Ai, representative from the Ekumen of Known Worlds, arrives on Winter to make first contact with the people there. He is able to adapt to the culture on Winter though he never really gets used to the cold or completely used to the asexual inhabitants. He finds himself in the middle of a political struggle between the two leading nations on Winter. Once he is able to convince them that his story is true, they each try to use him as a pawn in their geo-political struggles against the other. Genly forms an attachment with Estraven, a leader of one of the nations on Winter. He is not certain that he can trust Estraven who is later exiled from his home nation as a traitor. Genly is forced to flee to a rival nation only to find himself sentenced as mentally suspect to a prison farm where he is subjected to regular interrogations that leave him physically weaker and weaker. Estraven arrives, helps Genly escape and leads him on a journey across Winter’s frozen north lands to his home nation and safety. It is on this journey that The Left Hand of Darkness is strongest. Each character must overcome the clash of cultures, their evolutionary differences and their own suspicions of the other in order to survive. Genly has to deal with a man who is also a woman, while Estraven must deal with a man his society considers a perversion. That the bond these two form is so moving speaks volumes for Ms. Le Guin’s artistry. She creates a people and a culture that is fundamentally alien to our own, and then leads us to understand it well enough to see ourselves in it. 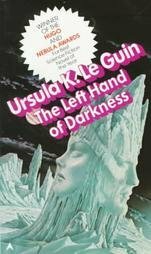 I’m giving The Left Hand of Darkness by Ursula K. Le Guin five out of five stars. I don’t know if Maria Doria Russell gives Ms. Le Guin a special thank you in the preface to The Sparrow, but she ought to. Her novel owes a great debt to The Left Hand of Darkness. If you enjoyed The Sparrow I think you will find much to enjoy here. Books like this one, along with titles by Marge Piercy and Samuel R. Delaney ought to be enjoying a renaissance these days, sine the issue of transgender rights has moved up from the back burner. What was once something only the distant edges of science fiction could deal with, the fluidity of gender, is fast becoming an everyday topic. Although it’s been a while since 2008 when I first published this review on my old blog Ready When You Are, C.B., even longer since the book was published in 1969, Ms. LeGuin still has much to show us about this topic. What is striking about this novel (and also in The Dispossessed) is that LeGuin does not resort to the usual science-fiction standby of describing advanced technology. Gethen could be 1930’s Finland or Russia. The resulting effect is that the world she builds, despite the differences in human biology with respect to gender, becomes remarkably authentic, particularly during the sequence when Genly Ai and Estraven cross a corner of the northern ice sheet to return to Karhide. I just have one correction to offer: The people of Winter are not male when they are not in kemmer, but hermaphrodites, and they are absolutely non-sexual in temperament when they are not in kemmer, perhaps like eunuchs.. Leguin offered this to highlight that humans of Terra like Genly Ai and other worlds are basically in rut all the time, and she traced out the anthropological consequences of that difference on Winter. For one thing, when Estraven, in close proximity to Ai on the ice, entered kemmer, his body automatically took on the female role due to the persistence of Ai as a male. ” Her novel owes a great debt to The Left Hand of Darkness.” — her novel makes a BIGGER debt to Blish’s A Case of Conscience (1958) — which is a very intriguing (albeit 50s in style/delivery) rumination on religion and science. Thank you both for your comments here. I stand both corrected and intrigued. I’ll have to look into A Case of Conscience. It’s great to have comments like these this time around. The first time I published this review, it sat without comment for six years. That depressed me a bit, because I think LeGuin’s books are wonderful and deserve a much wider readership than they seem to have these days. James, really? Le Guin has a giant readership! This is on every top ten SF list (this or The Dispossessed). Top ten lists of best books, but I don’t think it translates into a wide readership. I’ve posted on her books several times, and she does not get anywhere near the comments lesser writers/books get. I see her on other blogs only now and then, but again I see lesser stuff mentioned with greater frequency. It’s my sense that she really doesn’t have near the number of readers she should. A dedicated fan base, sure, but one that ought to be bigger. Currently on Amazon Left Hand of Darkness has 282 reviews, and is ranked 6,586. The Sparrow has 706 and is ranked 21,627. The Hunger Games has 21,240 reviews and is ranked 3. So, I’m going to say that we’re both at least partially right. Left Hand of Darkness sells better than The Sparrow, which is an excellent book, but it should have more reviews. I’ll argue that a sale is a sale, but a review is a reader. Almost all old books have less reviews…. The Sparrow is relatively new and The Hunger Games is all the current craze. As Le Guin’s novel was when it was published and continues to be. I shouldn’t argue this point, because I really want you to be right about this. I’d much rather live in a world where Ursula LeGuin really does have legions of fans. I do think that older books have fewer reviews because they have fewer current readers. I’m not old enough to recall if LeGuin really was as popular as Hunger Games back in the day; I didn’t find her books until high school, which was well after their first publication. I found Earthsea at least a decade before I read her science fiction. I hope there are many, many kids out there who are finding the Earthsea books and that they eventually move on to her science fiction. I will look for the other authors you mention, by the way. I am not arguing about the merit of Le Guin — I too read her fantasy first and then read virtually all her SF pre-1980 (prefer older SF). But, if there is a women SF author who actually has made it big from that era it IS Le Guin without a question. And the VERY fact that you have not read either Joanna Russ (who is rather famous as a feminist theorist), or others I mentions is exactly proves my point!